Finally getting started on scrapping photos from our “running from Matthew” recently. I’ve collected several photos, because that’s what I do, and am debating whether to put in an album all by themselves. Usually I just stick my pages all in chronological order, whether special event or just a capture of everyday times. The layouts are in chronological order once they are slipped into the albums, but I never quite seem to scrap them in order, so this certainly wasn’t the first set of photos. The small blocks of papers in the background are from a scrapper named Gabriella. We each participated in a swap with each other by sending a business sized envelope of scraps from our recent layouts to each other with the goal of seeing what we make out of them this month. I laid out her scraps on my table. Knowing I wanted to start scrapping my travel out of hurricane’s way these photos from the coffee shop caught my eye as likely matching some of her paper assortment. I liked this background solid for tying them all together, the photos and the patterned papers. Because of the busy photos and busy collection of patterns in the background I matted the pics in ivory. Used a Cricut cartridge for the title letters. The Fun Stampers Journey stamp set used here is just perfect. For the word “Amazing” I colored it in with my new FSJ gel pens. There are quite a few die cuts used here from FSJ also. Kris and I really enjoyed our cup! My community did well in the grand scheme of hurricanes recently. So grateful that when we returned home we found all was well. The worst damage I have actually viewed is some limbs and fencing down. Ruby, our chicken, was securely sequestered in the garage. Kristy unrolled a bundle of fencing wire, secured a couple of old sheets over the top to keep her from flying out, and set in her water and plenty of food. Once Matthew had blown over Kristy asked a friend to go get Ruby out if all was well. It was. Even her coop was still standing. Being a transplanted city boy, Mark had never actually held a chicken before. He did beautifully. We knew he would because Ruby has been held often and so is comfortable with being picked up. Mark send Kristy a fun text telling her that he just couldn’t understand what she was telling him. “She kept saying bawk-bawk, etc”. Made us laugh. We were so grateful to him for doing that for us. We feared that as the heat rose in the garage she might expire in there. During the short time I had to prepare to leave home, I chose to take the various packs of patterned papers from a bottom shelf with me to go through and organize. Taking a few stamping supplies, of course, would be the thing to do while we sat in the room at night as well. It would be like a mini-retreat. What a surprise to discover that all the rooms west of us were booked. Kristy started checking as I was driving. She found one in Spring hill for the first night but it would only be for tonight as all was booked for the next few nights. So the next closest was Pensacola after that. Sometimes the Internet can be untrustworthy as in our case for the Pensacola motel. It was not as represented on line. It was smaller than it appeared. There was no pool. There was no table, only a shelf and one chair. And there was nowhere else with a vacancy either. I insisted they find me another chair. Here is a shot of the pups when we went out. When they are in their kennel they are happy. The big girl, Zoey, is always fine. We did do some stamping, Kristy colored, I did a card. And I got the packs of patterned 12 x 12’s organized and in envelopes. My granddaughter and great granddaughter were in the habit of taking exercise just about everyday. Some walks were shorter, but most were rather hearty. There is a nice part down the road from their apartment complex. She said it’s about a mile or so. By the time one winds their way out of the complex I suspect it is certainly well into the “so” portion of the estimation. The next day after I arrived I gladly joined the walks. To my surprise Tiny Tot rides her bicycle. I feared one of us would be pushing the bike home while the other carried the little one. Not so! She is a tuffy for sure. There were talks about nature as we went along and several stops to pick a wildflower. Soon, though, she had to be convinced to stop and look, but leave them, She realized they were always withered by the end of the walk when she picked them and placed them in her basket. Here is a layout I did with those first photos. It went quickly because I was lifting a page done by a scrapper on Splitcoast stampers a while back. I selected papers from my scrap bin for the squares. Before placing anything, though, I spattered ink with a toothbrush. Digging into the stash bags I found the word pieces and tags. The yellow strips are K&Co I think. It’s all a hodge podge of companies. I did do some stamping. The bottom left panel is a Fun Stampers Journey stamp, so is the little yellow saying near the top (which is hard to see-should have used a darker ink). The bottom tag says “19 days to “D” day”, meaning until baby will be born. She stayed healthy by walking, eating right, even going to the gym a couple times a week. She is one awesome young lady, I’m very proud of my granddaughter. Stay happy by staying crafty! I’m standing in the dining room, getting ready to leave and my phone “dings” me. It was like my wake up alarm only I had turned it off a good while back. I look at my phone and it says “according to current traffic conditions it is time to leave for the airport”. How did it know that?! It calculated this from the info it had on me. I had put the time and location in my Calendar. It knew that I needed to be at the airport at a specific time and now the phone was reminding me how many minutes it would take me to arrive, so I better get going. I was amazed. Fortunately we made it to the airport, just like my phone wanted me to do. Here is a tip if you are planning to travel by air: don’t wear a sparkly top. It apparently will put the metal detector computers in overload and invite an unwanted pat-down! Have a marvelous day and thanks for popping in! My household has doubled in size. My Tiny Tot and her mother have officially moved in. 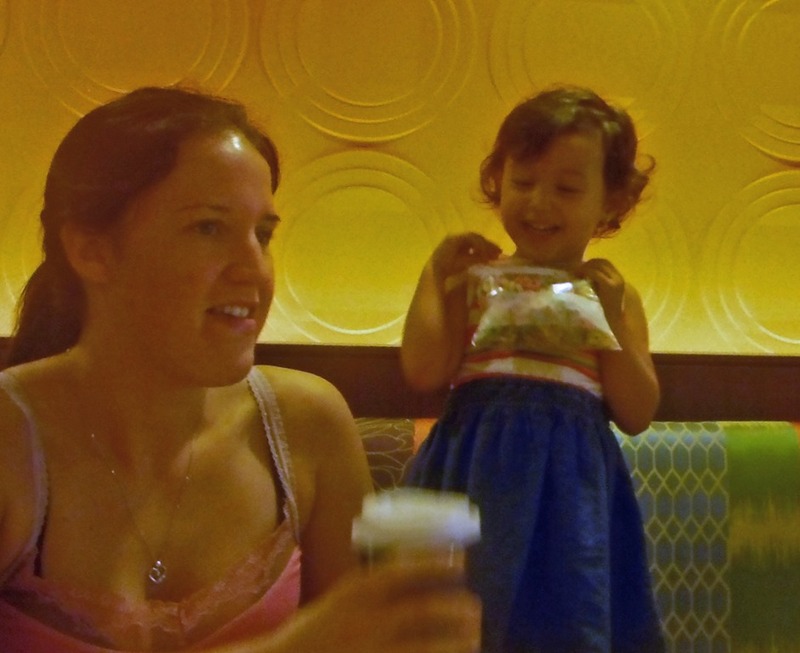 The hotel man was so sweet to fix Tiny Tot a baggie of cereal to snack on during the trip. So after a nice breakfast our caravan was ready for the last leg of the journey home. My sister Paula generously volunteered the use of her vehicle. We could not have brought all their belongings down without her. I have the sweetest and best sister in the world! And I really enjoyed her companionship during this hectic trip. The weather paid us a nasty call in the form of heavy rain, hail, and even tornados as we made our exit from Virginia. We were trapped in a torrential downpour, thunder boomed so closely we feared we would be struck down as we pumped gas so we could take the expressway out of town. Once we were out of the populated area the rain eased, but we began to notice leaves along the roadside as if a huge mower had come by. Information came to us at the next stop for fuel – a tornado had touched down in the area while we were had been fueling previously several miles away. As we made our way to I-95 we saw sporadic damage; trees randomly cracked to the core, utility poles down, and a few remnants of traffic accidents. One particularly memorable one was a semi over the guard rail. We were so fortunate! 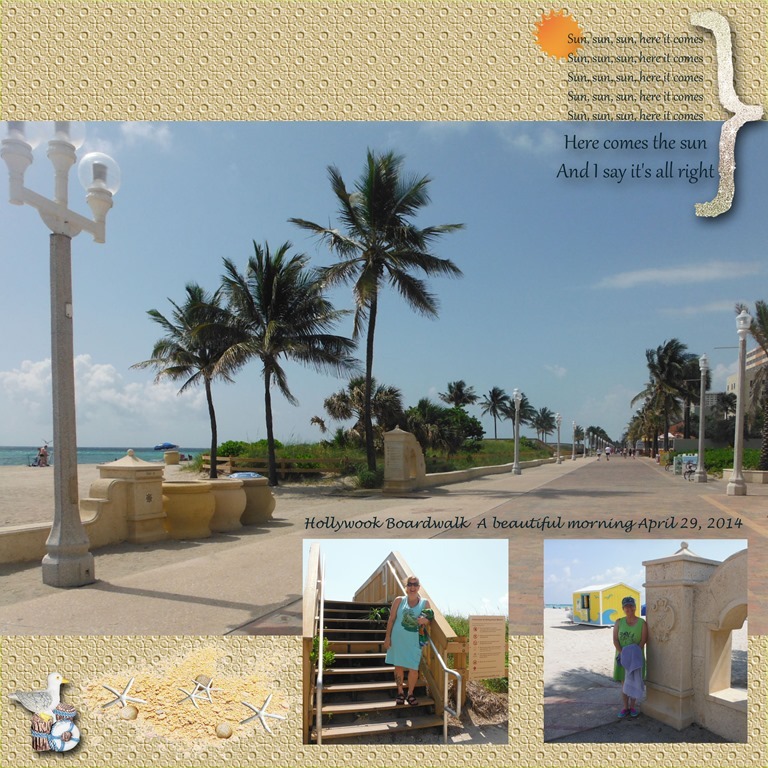 Hollywood, Florida has a lovely boardwalk. Taking a stroll, north from our hotel, we came across a band playing very familiar tunes from the 60’s. They were impressively good. It delighted me to see the old couples, several of them, out there dancing together. Loved it! Made me wish I had a partner. Unfortunately I never got a dancing one all those past years. Oh well. I used the Lea France stencil “Harmony”, which I love, and put the pics on a patterned background paper by My Mind’s Eye. I used some glitter card stock. For embellishments I have a star burst top left and a row of tiny star brads in the center. The writing is computer generated. I have to announce that I am now officially on the Lea France Design team! This makes me so happy since I am totally wild about all those template stencils. And I’m so addicted to all the designs that can be created. Like working a puzzle with a beautiful product at the end – a scrapbook layout for sharing with future generations! If you are on Pinterest you can see this layout and more here. Also, here is a link to the Lea France website, but it may be changing, for now, check it out here. I hope you stay with me as I bring you more French Photo Collage layouts. Thanks for stopping in! 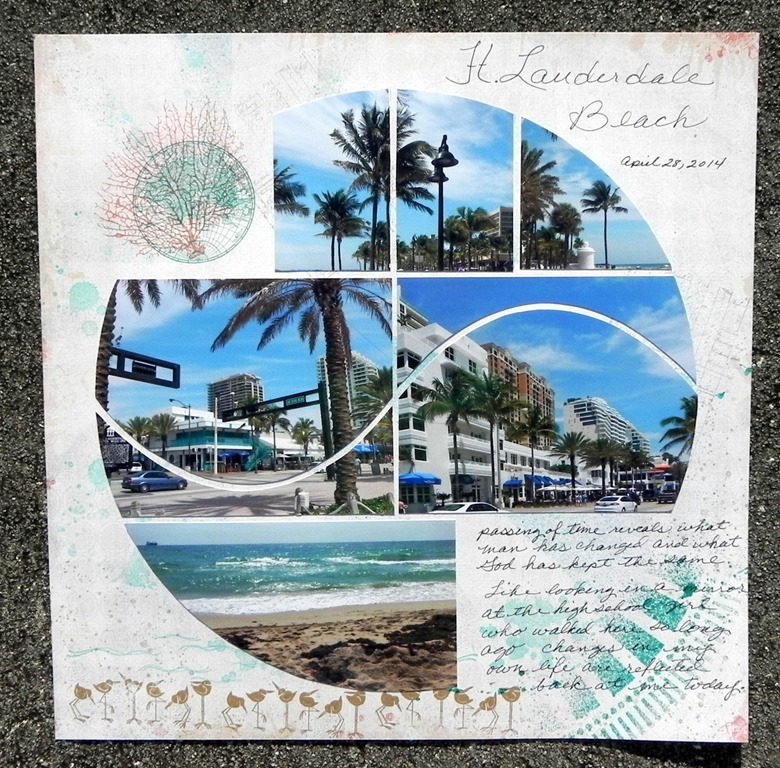 Another scrapbook page with the Lea France Harmony stencil and some pics from the intersection of Las Olas and A1A. It was the central point back in my High School days for going to the beach. My friends and I spent many days there. Today it is a lot different, more hotels – bigger ones, the street parking is gone and there is a lovely sidewalk now, the main street is one way only. I parked across the street in the city lot for $1.75 an hour. Lots of parking though, unlike the days of driving up and down till someone pulled out or parking a few blocks away and walking. The walk across the street from the huge lot makes it lots easier. Anyway, I did lots of stamping on the paper (Pink Paislee) with my Stampin’ Up stamps. I first spray over a couple of stencils the used the stamps. I hope you like my arrangement and photo choice for this stencil. I wanted to share what a sunny and beautiful morning we had yesterday. 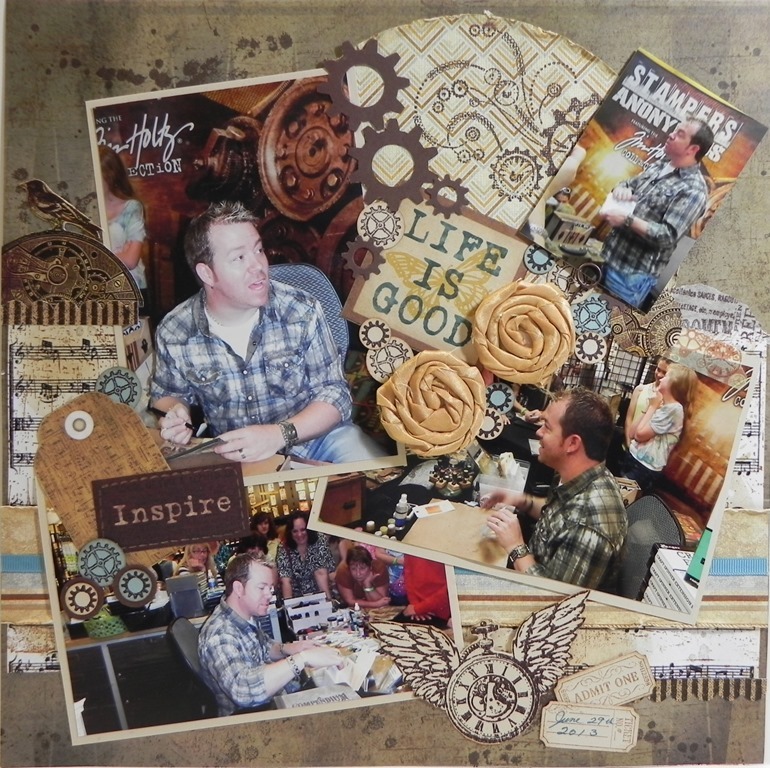 This scrapbook page reflects the feel of the day in it’s simplicity. 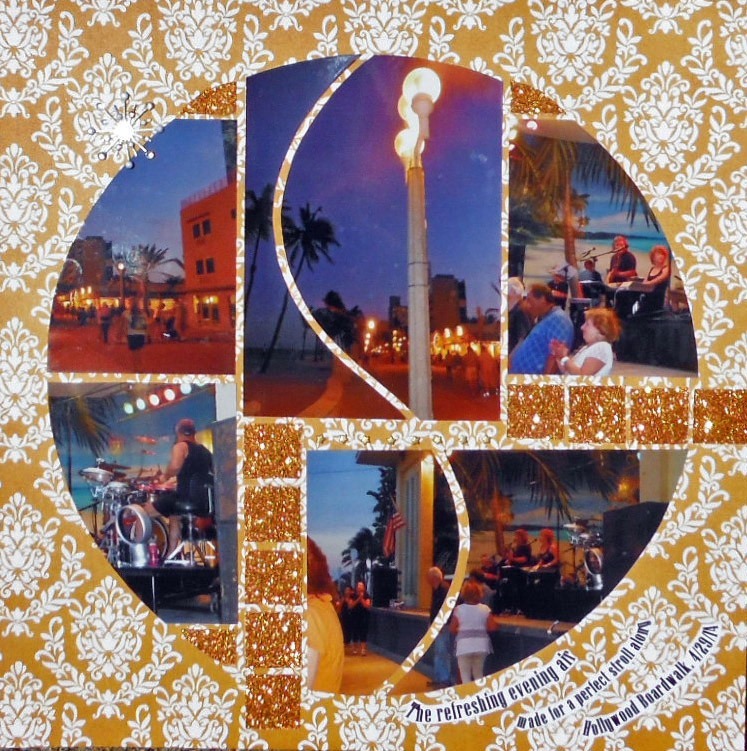 I let the main focus be the photo of the boardwalk with two inserts of each of us. I followed a Splitcoast challenge to use a sun and the lyrics to the Beatles song, perfect fit! The crowd was tight. I could not see over anyone’s head. These women were not budging an inch. Waiting for someone to kindly move out to allow someone else a chance to see wasn’t on any of these women’s agenda. All I could do was hold my camera up high and over as much as my little short arms could reach and snap. Here is the layout from some of those pictures. Oh, and yes, the bag Kristy is holding was signed by Tim! Let’s Scrap sketch, and worked out the DT Challenge from Michelle to make my own music sheet paper, which I printed off the computer, placed in a pan, and poured strong tea over it. I then stamped it with a background stamp or two. The golden flowers I made by twisting a strip of taffeta and pasting it down on a circle of cs. Supplies: Paper – Glitz, Authentique, G45, Recollections, DCWV, solid cs by SU, matted with Fox River confetti sand. 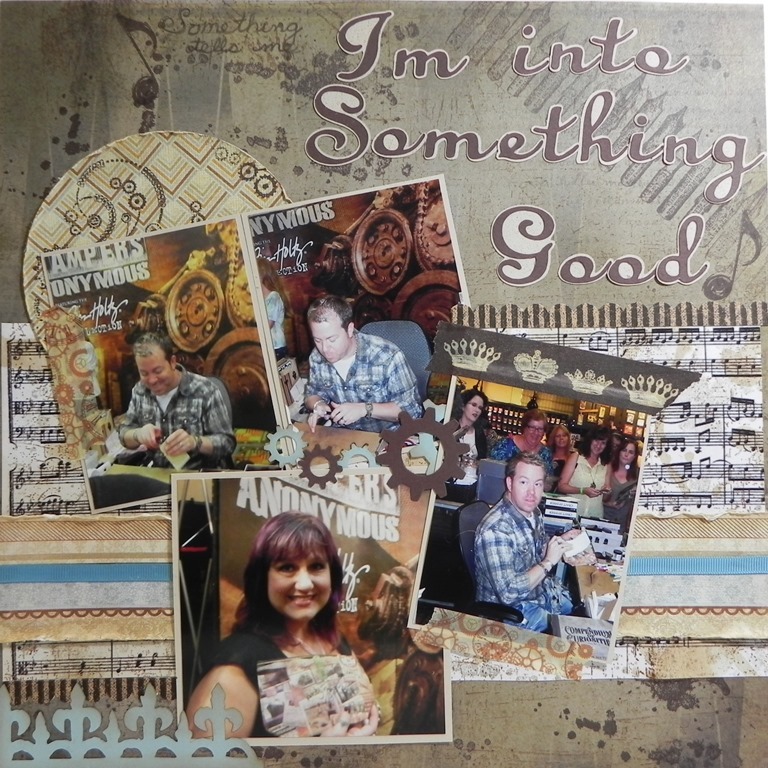 Stamps – Tim Holtz, Inkadinkadoo, Stampin’ Up!. Inks – TH, SU! TH Iron Gate die cut. SU! cog, ticket, circle punches. Various craft tape. Fiskars circle template & cutter. Song title is by Herman’s Hermits and was cut with Cricut. 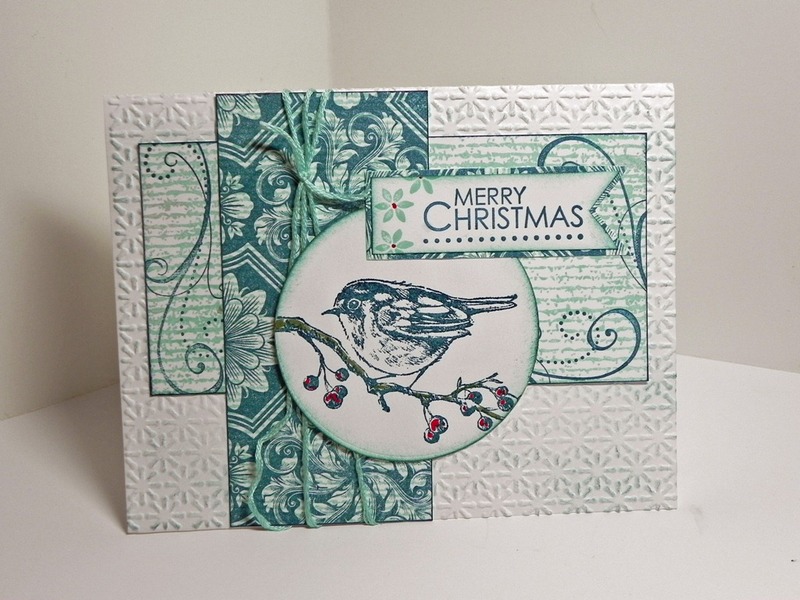 First Christmas card for July using the background stamps I bought yesterday from Obsession Impression. For tis card I used a bird on a branch from Inkadinkado. I stamped it in Island Indigo and clear embossed it, added some red marker and cut with a Spellbinders Nestabilities circle. I was following the sketch and the color challenges from Splitcoaststampers.com. On the white card I use a Stampin’ Up! embossing folder Snowburst. The inks are SU also – Pool Party and Island Indigo. I created the panels with my OI stamps, and added the swirls to one from the Season of Joy stamp set, as is the sentiment. I wrapped a panel with DMC floss for my only embellishment. 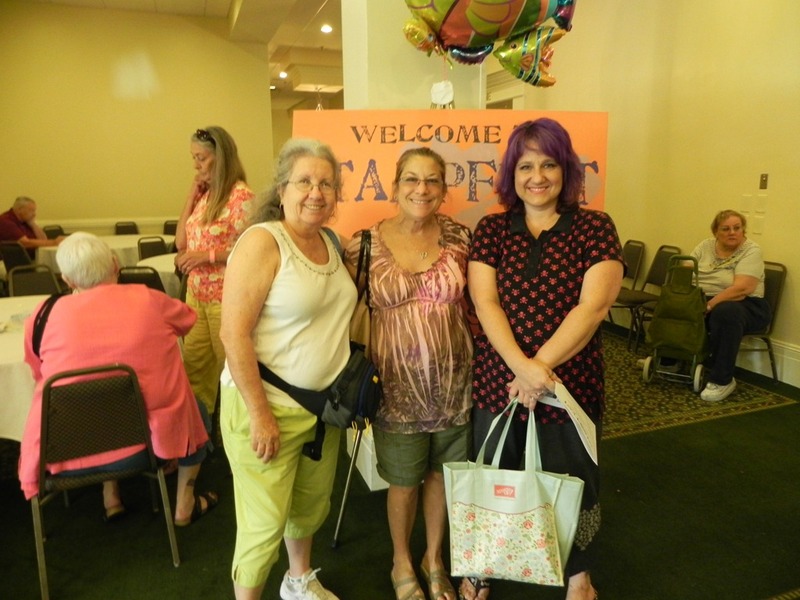 Here is a pic of my happy group who went to StampFest. 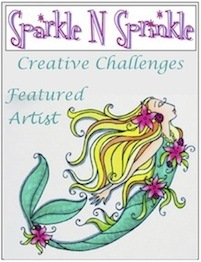 Creative Inspiration Wednesdays Challenge Blog – Anything Goes – I have entered this challenge in hopes of winning a prize from Mel Jens Designs!